For each and every one of us, our first day at a new job is one of those very important moments in life. That is why, year after year, on that specific day, we all tend to cast back to this threshold event in our careers: a day upon which we most likely received a lot of attention, but which was probably equally marked by feelings of unfamiliarity. A Seniority Day makes for the perfect occasion to reflect on our professional, but also personal, growth. Imagine someone very special in your life forgot all about your birthday. Or imagine your partner not remembering your anniversary. It seems safe to say these instances would probably leave you feeling hurt, or at the very least disappointed. So, in analogy, how would you feel if at work your Seniority Day went unnoticed? After 1 year of service, you probably don't expect too many bells and whistles just yet, so it most likely won't leave you feeling too unsettled. But what about the Seniority Day marking your 10 years of service? What if on that day your boss and colleagues just greet you with the exact same "good morning" they greet you with every other regular morning? Birthdays and anniversaries are special and important to each and every one of us, and whether these are then personal or professional doesn't make the slightest bit of difference! That is why celebrating Seniority Days is the perfect way to show your appreciation for the efforts people have been making in the course of their employment: emphasise they truly matter and let them know how important their contribution to the success of the company has been. Here below, we have collected 7 quick and budget-friendly tips to help you make the utmost of your company's Seniority Days. That way, you can turn that professional birthday into a truly special and unforgettable day for each and every one of your employees. Express what it is that you appreciate about the efforts your employee has been making in the course of his employment. And, above all, make sure that your message truly gets through to him! Look the other person in the eye, smile at him or her and make appreciative gestures such as a pat on the back, a thumbs-up, a handshake, … Show genuine interest in the other person. Ask about the significance of this day for your employee and truly listen to what he has to say to you. Surprise your employee! Do something for him that you usually don't. Bring him his favourite cup of coffee or tea, offer to wash his car, sing (or play-back) a song that you picked especially for him, organise a 10' Popcorn Party with the team, take on his kitchen duty, lend him your office chair for the day, … we bet you that in 10 years' time everybody will still remember your surprise! Provide for a little something that will remind your employee of this special day. A (home-made) award, a personalised T-shirt signed by the entire team, a framed certificate, a beautiful pin, … Experience teaches us that even decades later such small tokens still hold a special place on people's desks! Address your employee's colleagues (or why not family or friends?) and collect anecdotes and/or pictures. Then get creative and turn them into something fun: a crazy poem, a funny PowerPoint, a flashing wall of fame, … and use it to decorate the employee's desk on his Seniority Day. Organise a short surprise party to which the entire team is invited and celebrate your employee. Personally thank him in front of the team and emphasise how important his contribution to the success of the company has been. Behind every successful employee stands a family that supports and encourages this person - every single day. Don't forget to thank them too by sending them a little card, a bouquet of flowers or a surprise basket filled with goodies for the entire family. Emphasise how important the employee is to the team, and how proud you are to have this person on board. And above all, express your gratitude for the good care and understanding your employee gets at home. As we said before: nobody likes it when his or her birthday goes unnoticed and this is no different when it comes to a Seniority Day. So to consciously concentrate on an employee's efforts on the day he has been working for the company for X amount of years, is vital. At the same time, however, don't wait until this day to genuinely appreciate someone's efforts and commitment! Express your recognition and gratitude throughout the entire year - day in, day out. 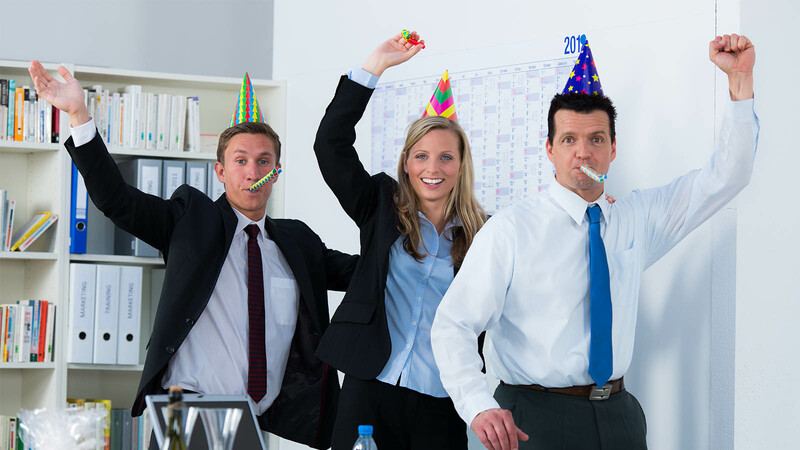 HR News: 7 ways to celebrate an employee's Seniority Day in 10 minutes (or less)!